Tabular crystals of hexagonal but partially rounded shape. 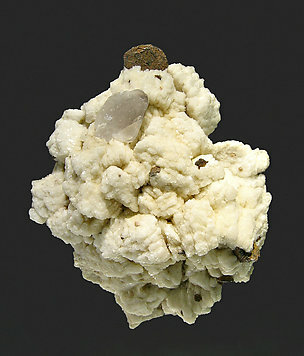 On a matrix of Albite crystals and with small crystals of Siderite. Very sharp dipyramidal Florencite-(Ce) crystals, with a very good length for the species, very well defined faces and edges and a clear cream color. 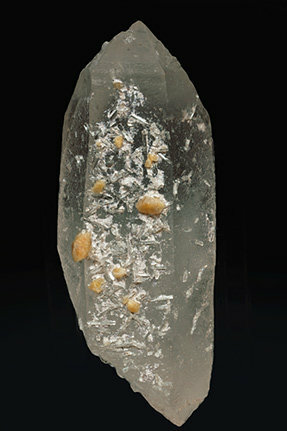 They are implanted on Quartz crystals with colorless transparent Milarite crystals, a lot of them doubly terminated. Florencite-(Ce) is a very rare phosphate. 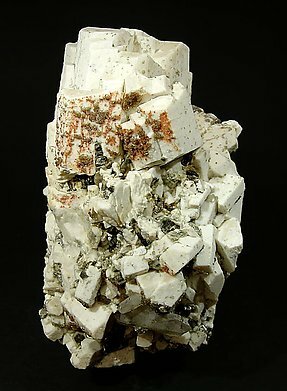 In this case the small red crystals are distributed on Microcline and accompanied by Quartz and Mica.